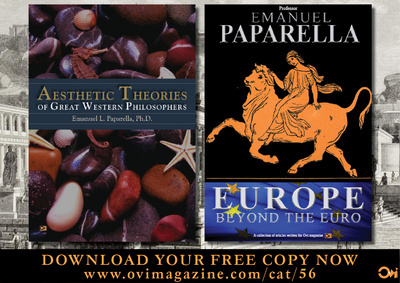 Has the Caligula Presidency Dealt a Fatal Blow to the North Atlantic Alliance? On May 26, 2017 there was a meeting of the G7 in Taormina, Italy following a previous NATO meeting in Brussels only a few hours before. Taormina, dubbed Tauromenium by the ancient Greeks who founded it in the 8th century BC, became later an important city of Rome’s empire. Cicero calls it “civitas foederata” or confederated city, meaning that it was not considered a mere colony or a territory of Rome, but an independent ally. It bears mentioning here that the genius of the Roman administrative system was based on the fact that it was a rudimentary confederate system perfected many centuries later by the US founding fathers in their Confederate Papers (which became the basis of the US constitution) which some scholars have judged a work of genius at a par with Plato’s Republic or Aristotle’s political tracts. While it is true that Rome maintained a general oversight over the various provinces of the empire, by and large, people were allowed to retain their languages, their customs and their culture and to a certain extent were granted a modicum of interior domestic self-government. There were kings who ruled their own kingdoms and people and made their own internal domestic laws. Rome took care of external relations, or what today we call “foreign policy.” Some of those provinces were called “commonwealth” (a concept adopted by the British Empire later on). Those kings were not made to feel as complying subjects of Rome, but as willing allies and participants. If there was a motto it was this “all for one and one for all.” To be part of the empire and to be a Roman citizen was an honor implying both duties and privileges. St. Paul, for one, invokes his Roman citizenship when he is unfairly arrested and imprisoned in Rome. By Roman law, they had to grant him a trial before a sentencing. Keeping well in mind that sort of historical, geo-political background, it was quite fitting for the G7 to have chosen Taormina for their yearly meeting. 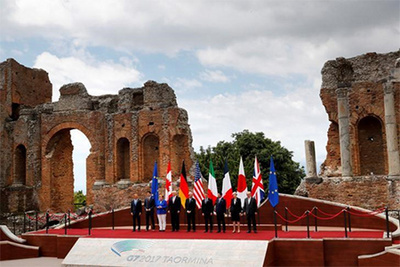 There is a picture taken at the “Teatro Greco” by the leaders of the G7 which is quite suggestive (see above). On the stage among the Greco-Roman ruins we detect seven flags flanked by two EU flags while the leaders of their respective nations pose in front of them, suggesting that this is not a mere photo opportunity by some show-boaters to celebrate their gathering, but rather, to show that, not unlike NATO, this is an alliance of equal partners to discuss common values and interests. In other words, this is not a “show-off” Machiavellian power exercise staged by a slightly deranged emperor to impress the rest of the world with his importance, but a celebration of common values and common interests. Notice that the American flag is just one of the flags and it’s not even in the center; it is certainly not meant to exemplify the imperial flag of a mad emperor Caligula; hence there are two EU flags flanking the others. The implication, and the only correct interpretation to my mind, is that this is a democratic alliance of equal partners, not a tyrannical empire based on despotic industrial economic military power. Quite symbolical too is the fact that the photo is taken among the ruins of what was once called the glory that was Greece and the grandeur that was Rome. Is this the equivalent of writing on the wall, or on the ruins, as the case may be? Be that as it may, at this point of our inquiry the question arises. Was that ideal interpretation, in fact, the reality of what transpired in Brussels and Taormina? Let’s see. Article five of the NATO (North-Atlantic Treaty Organization) clearly states that an attack on one of its members shall be considered an attack on all, triggering thereby a common defense mechanism. It is not far-fetched to surmise that such an alliance has in part assured peace and prosperity on the European continent and the North American continent for some 70 years. This idea of a mutually beneficial alliance is in fact similar to the idea of commonwealth or mutually beneficial alliance as envisioned by the Romans. It’s important to observe that article five has been invoked only once during the 70 plus years of the treaty’s life; namely, after the attack on the twin towers in New York of 9/11. It triggered the mechanism of common defense and the EU substantially contributed to the military effort in Afghanistan, still ongoing. The EU has shed treasure and blood in the process, to the tune of billions of euros and hundreds of EU soldiers’ lives lost (from various nations of the EU). At the NATO Brussels meeting of May 25, President Trump not only failed to commemorate the collaboration of the EU to the common effort in Afghanistan, but he insulted the allied nations by scolding them publicly, in effect lecturing them (something he reassured the Saudis he had no intention of doing) of failure to pay their financial dues to NATO. Moreover, not once was the common obligation spelled out in article five of the treaty even mentioned and reaffirmed. What are the obvious implications of this amateurish display of gross incompetence in diplomacy and foreign policy by someone who claims the mantle of leadership among the democratic freedom-loving nations of the world? Has a final fatal blow been dealt to the North Atlantic alliance? There is no doubt that Putin and his cronies must have opened a bottle of champagne at such a display of ignorance and incompetence regarding Western history. For a good many years now his whole Machiavellian strategy is one of “divide and conquer.” Divide Europe from North America (which includes Canada, of course); divide the NATO alliance, divide the EU alliance of Western European countries; encourage them to follow the Brexit example; establish and finance Trojan horses all over the EU via parties which encourage xenophobia, anti-immigration sentiments, authoritarian anti-democratic leanings. So far those destructive phenomena have been successful and it has certainly not in any way deterred the Russians from their efforts at misinformation, fake news, and the destabilization of the democratic system. To return to the photo above: are those ruins prophetic, crying about the coming gathering of the whirlwind? Have we already witnessed the beginning of the end for Western democracies, and consequently, is NATO and the North Atlantic alliance obsolete, as Trump and other misguided “experts” on both sides of the Atlantic believe? But, as the founding fathers of the US proclaimed at the birth of their new nation: those who do not hang together will eventually hang separately. The grizzly bear from Siberia would like nothing better. In any case, barring an oracle’s verdict the final outcome of this unfolding tragedy, dooming democracy as we know it, is hard to predict at the moment. But history is sure to eventually render a final verdict. Alas, the omens are not very encouraging at the moment. Mr. Trump is a grasping Calvinist who missed his true vocation as president of the local Lions' Club, but hardly a Caligula.